Virtual keyboards are another example to the advancing software and devices technology. Virtual keyboard is a form of computer input device through the digital image of the keyboard, either on the screen of the device or through the projector using laser or LED light. 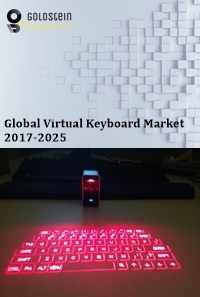 The growing penetration of internet and computer devices and the advancing technologies are driving the growth of global virtual keyboard market. In 2017, more than 35% of the population is estimated to use the smartphones, which is thus the opportunistic market for the growth of global virtual keyboard market. Laser virtual keyboard device projects the keyboard that enables fast speed typing, easy to carry anywhere and can be connected to any compatible devices. The growth in e-commerce and logistics has made the online distribution channel a preferred platform for the consumers, thus maximum number of units sold accounts to the online distribution channel. Further, global virtual keyboard market is expected to face challenges from the advancement of the alternatives to keyboards, such as speech recognition and hand gesture control technologies. Goldstein Research analyst forecast that the Global virtual keyboard market is set to grow at a CAGR of 6.72% over the forecast period (2017-2025). On-screen virtual keyboard accounted for largest share of 63.7% in 2017, owing to its easy availability on online application stores and they have stayed in the market over the longer period of time as compared to projected keyboard. But, over the forecast period projected virtual keyboard is expected to take over the market share of on-screen virtual keyboard on the back of its convenience and compatibility with different devices. Based on geography, North America accounted for the largest market share of 34.7% in 2017 of global virtual keyboard market for the largest consumer of virtual keyboard across the world. Europe closely follows North America market share on the back huge application in consumer care products. Asia-Pacific region is expected to be the fastest growing region at a CAGR of 5.9% over the forecast period on the back of growing number of industries that is impacting demand for virtual keyboard. The report covers the present ground scenario and the future growth prospects of the virtual keyboard market for 2017-2025 along with the market players’ analysis. We calculated the market size and revenue share on the basis of revenue generated from major players in the Global region. Global virtual keyboard market is forecasted on the basis of virtual keyboard production supply and agricultural produce. Global virtual keyboard Market Outlook 2017-2025, has been prepared based on an in-depth market analysis from industry experts. The report covers the competitive landscape and current position of major players in the Global virtual keyboard market space. The report also includes porter’s five force model, SWOT analysis, company profiling, business strategies of market players and their business models. “Global Virtual keyboard Market Report” also recognizes value chain analysis to understand the cost differentiation, pricing models to provide competitive advantage to the existing and new entry players. Our Global virtual keyboard market report comprises of the following companies as the key players: Google, Celluon, Mount Focus Information Systems, iNextStation Virtual, CTX Technologies, Lamaston, Maxsync.